Let’s be honest: Who, this day and age, hasn’t heard about Segway? They are the original manufacturers of electric self-balancing scooters. Late 20-somethings (entering our thirties) can remember Segways in our early adolescence. This means their Segway i2 SE personal transporter (PT) is a great product in the self-balancing scooter market. But just what is the i2 SE, and what makes it so special? Let’s take a look. Right off the bat: the machine itself is an upgrade. “SE” stands for “second edition.” One major difference you’ll notice right away between the I2 SE and first model is the console, which “sits” between the foot platforms. On the SE, this console is lowered (making it look a lot more slick and upgraded). This is to make your feet less likely to “catch” on the console, putting your safety in jeopardy – the way the original i2 did. Lowering the console like this simply makes mounting and dismounting the PT easier. Despite this leanSteer-disassembling ease, the i2 SE weighs a whopping 105 lbs. (47 kgs.) Put simply, this machine is a monster and should never be lifted by you if you can’t lift that much. It’s also worth noting that, while there is an LED light on both the front and back of the i2 SE, these do not help you see at night – as they are not proper headlights or taillights. These were installed so oncoming traffic can see you, thereby increasing your visibility. However, a mountable headlight can be easily purchased (in any major home hardware store) and attached to the i2 SE. For the uninitiated (or those who never personally rode a Segway PT before), the driving mechanics are simple. To go forward, all you have to do is lean forward. When you want to stop, merely lean backward. To steer (while you’re in motion) left or right, simply lean left or right—with the bar—to turn it. Whichever way you lean, sensors in the machine “tell” the motherboard (similar to MOBOs inside personal computers) to lean in that direction. The i2 SE comes with dual 1500W brushless motors (one to each wheel), making steering easily able to take you wherever you want to go – like Meg Ryan’s home, for example. As you can naturally see, the i2 SE PT’s wheels are huge. (The device is massive in and of itself.) This means you can ride over bumpy, grassy, or rocky terrain with relative ease, without worrying about damaging the product or hurting yourself. Part of the reason for this is due to the five balancing sensors in the device itself – all of them connected to do all the balancing for you. In the event that any component inside the i2 SE fails, the device will immediately stop and shut down. Segway designed this system as a safety device for riders. Another safety feature (in the event of a component failure) is a loud, obnoxious beeping alarm that lasts for 10 seconds, alerting you to get off the Segway. 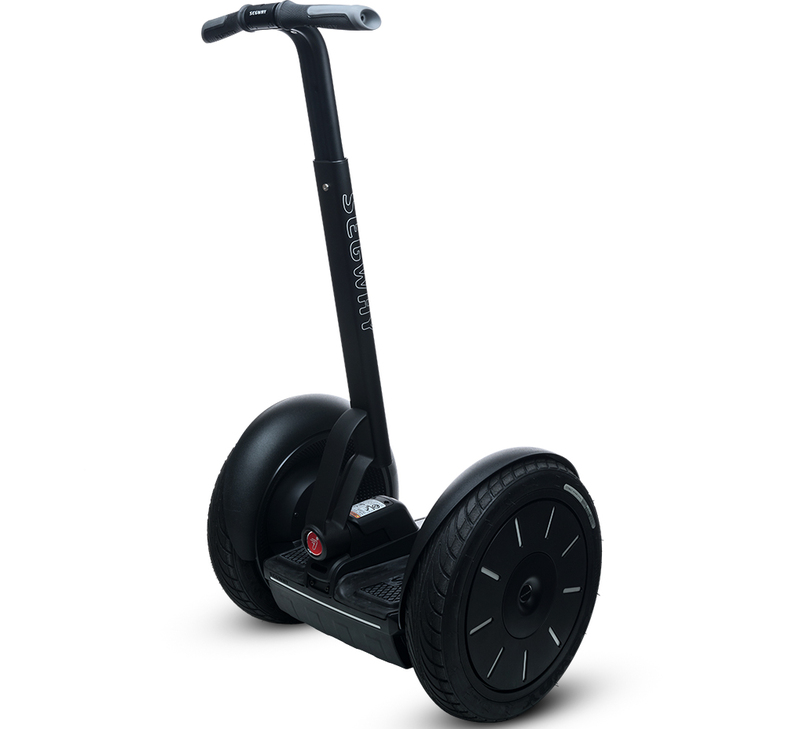 The Segway i2 SE runs on a single Saphion lithium-ion battery. (Lithium-ion has become the industry-standard form of battery for most self-balancing scooters and Hoverboards.) On a single battery charge, you can expect to travel a total of 16-24 miles (25-38 km). This is a phenomenally-long distance – it could take me from the nearest town directly to my apartment (17km away), making it convenient for travelling and even grocery shopping or visiting friends. It’s worth noting that the total distance travelled depends on your riding style (are you slow or fast?) and terrain – do you prefer grassy hills and rocky paths or smooth-paved sailing? Even more remarkable is the fact that the PT can reach nearly 12 ½ miles an hour (~20 km/h). This machine is downright fast – especially when you’re riding it. Segway has the prestigious honour of being the world’s original self-balancing scooter brand – and with good reason. Segway has been in business since 2004 (13 whopping years) and is surely a household name, and has a name synonymous with quality. That said, one of the major downsides of the i2 SE is its price-tag. If you have $5,000 to spend, this Segway PT is an absolutely terrific investment. For the rest of us, though, owning one remains a mere dream. However, the $5,000 sale price isn’t high-ticket for no reason. As is the case with most things in life, you get what you pay for – and the Segway i2 SE personal transporter is no different. Segway is not trying to rip customers off with the high price, nor are they a greedy corporation. Once you step on the machine, it’s easy to justify the high price tag (and frankly, amazing that it isn’t higher). Unless, of course, you’re used to paying for cheap machines and “bargain-bin” items. Segway is a premium brand name that releases premium-quality products, and their premium prices reflect that.